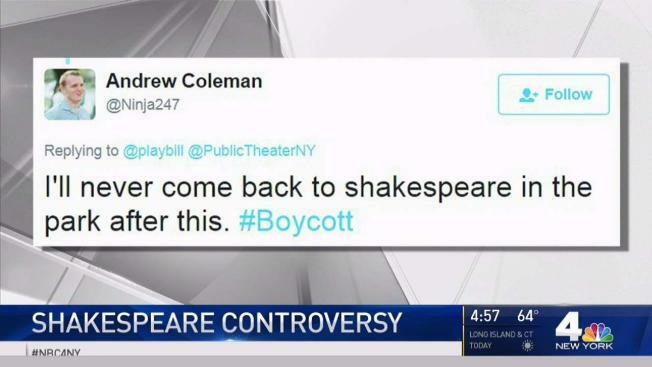 Police are investigating threats made to the wife of the director of a New York production of Shakespeare's "Julius Caesar," which depicts a Trump look-alike character being assassinated and has caused outrage among right-leaning activists. Police said Wednesday Oskar Eustis' wife filed a complaint on June 9 saying she received several threatening phone messages she believes related to the play. She said one caller wanted her to die after saying her husband wants President Donald Trump to die. Messages left with the director and a theater spokeswoman weren't immediately returned. The Public Theater's production in Central Park has garnered intense criticism since it opened. Both Delta and Bank of America pulled their sponsorship of the Public Theater, and several people were arrested for storming the stage in protest. And on Sunday, two 28-year-old men were arrested after storming the stage and shouting "Liberal hate kills!" The performance Sunday was the final performance of the play.